The main item in a birdwatcher’s toolkit is a good pair of binoculars. 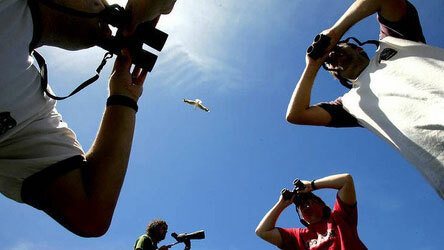 If you are going afield to watch birds you will need binoculars. Good ones. But which binoculars? Here’s help. Bird-worthy binoculars must deliver a bright, clear image. In addition to having great light-gathering ability they must have a wide field of view. They must have high resolution and transmit accurate color. They must focus quickly and not lose too much of their field of view when used with eyeglasses. There are great choices in every price range, but the price-point binoculars sold in department stores and mass-market sporting goods stores and catalogues are often compromised when it comes to quality, and are unsuitable for serious birding! One of the first things you will notice when you go shopping is that all binoculars are described by two numbers such as 8×42 (pronounced “eight by forty-two”). The first number tells you the magnification, or how many times the image is being enlarged. The second number tells you the diameter of the objective lens (the lens at the fat end of the tube) in millimeters. Thus a binocular described as 8×42 magnifies the image eight times and has an objective lens which is 42mm (1.65 inches) in diameter. Generally the bigger the difference between the two numbers the sharper and brighter the image, but there are limits. Binoculars with objectives that are larger than 42mm will be too big and heavy to carry around all day. Objectives smaller than 32mm are not bright enough to reveal all the detail you need. Brightness and field of view are far more important than magnification. A binocular which magnifies an image eight times also magnifies the small movements of your hand eight times. It also magnifies infrared which you will see as “heat shimmer,” a type of distortion which will be exaggerated by high power binoculars. Ten power (10x) binoculars are more tiring to use, have a smaller field of view, and are not as bright as seven or eight power models. Nevertheless, some birdwatchers like the extra power. Binoculars with 12x, 16x or higher power which you will find in catalogues or department stores are not suitable. I strongly recommend that you buy binoculars which magnify the image at least six and no more than eight times. What about field of view? A wide field of view is one of the most important characteristics of a bird-worthy binoculars. A wide field will make it easier for you to find birds and much easier for you to follow a moving bird with your binoculars. A binocular’s field of view is described either by an angle of view expressed in degrees (e.g. 7°) or by the diameter of the field at 1,000 yards. To convert an angle of view to field of view multiply the angle by 52.5). Bird-worthy binoculars should have an angle of view of at least 6.5 degrees which is equivalent to 341 feet at 1,000 yards. Bird-worthy binoculars should offer eye relief of at least 17mm (about 5/8 inch). This means that your pupil can be 17mm away from the eyepiece and still see the entire field of view. They should also offer retractable eye cups. Use them in the fully retracted position with your eyeglasses, and fully extended without eyeglasses. Your binoculars should serve you well for many years but they require some care. First, don’t drop them if you can help it. Second – keep the lenses clean and keep your fingers off them. 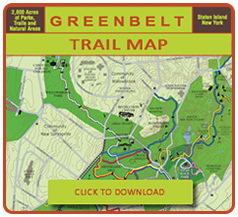 Signs of spring can appear in the Greenbelt before Presidents Day. 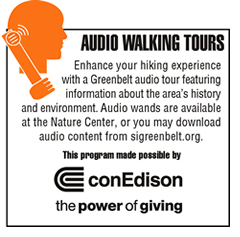 In this audio walking tour presented by ConEdison, WQXR radio host Jeff Spurgeon explains. Your binocular lenses are coated to minimize reflections between the lens elements. That coating can be easily scratched or destroyed by ammonia-based glass cleaners and cannot be replaced. Clean your lenses with a microfiber lens cloth or with paper lens tissues sold by eyeglass or camera vendors. Don’t clean them with toilet paper, paper towels, your shirt tails, your tie, or napkins. Those things will scratch the coatings. Use an ammonia-free lens cleaner which says it is safe for coated lenses. Don’t use Windex, spit, orange juice, or coffee. To clean your lenses spray the lens cleaner on the cloth, not on the lenses, and wipe gently. I recommend that you buy binoculars with the following configurations – 6×32, 8×32, 7×42, or 8×42. Buy binoculars which have a single focusing knob located between the two barrels which turns no more than 1½ times. Do not buy binoculars with separate focus adjustments on the two barrels. If you pay more than $200 for your binoculars, they should be water proof and purged with nitrogen to keep moisture out so the lenses don’t get “fogged” by condensation in humid conditions. Try them. Make sure the binoculars you are considering are comfortable for you. Do they fit your hands? Can you reach the focus knob without stretching? Can you see the entire field of view with your eyeglasses? Can you adjust the barrels so you see a single image? Don’t buy a binocular which isn’t comfortable for you. Don’t buy zoom binoculars. You will likely zoom them out and never use the feature again. Buy the correct power and avoid the compromises that come with the zoom function. Skip the image stabilized binoculars, which involve, among other things, a battery and a motor. Like zoom binoculars they are heavy, give up a lot of brightness and have a much smaller field of view. Avoid binoculars that have orange (sometimes called “ruby”) lens coatings. They typically transmit inaccurate colors and are often used to compensate for low-quality optics. Be wary of binoculars from a big-box department store or catalogue. Big stores depend on sales volume, so they tend to stock optics that cut corners on quality to meet market price points. 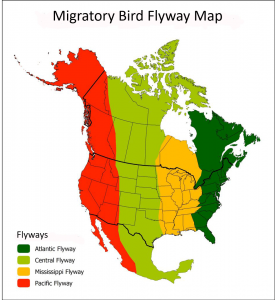 Be careful about seeking birding-optics advice from hunters, boaters or non-birders. Their needs are different. Do ask fellow birders about their binoculars and ask if you can look through them. Pentax Papilio 6.5×21 (about $115). This binocular was designed for looking at butterflies but I have included it among my recommendations because they are great fun to use. They weigh almost nothing so hikers should love them. They focus down to a few inches so it’s like having a pocket microscope. 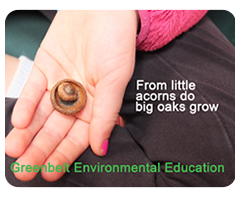 This is my number one pick for kids who love nature. And they work for adults who just want to have a pair of binoculars to keep in their pocket. Wayne Mones is a lifelong bird watcher who grew up selling cameras and birding optics in his father’s camera store. He has written about birding optics for the optics blog “Better View Desired,” and for Audubon magazine.